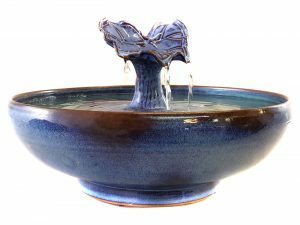 It is not surprising to see that many people seek a fancy cat fountain rather than simply a functional fountain you wouldn’t want in your living room. After all, why not beautify your home while providing health for your cats? But more importantly, this is a matter of health. Your cat fountain shouldn’t be in the kitchen, next to his food dish – in nature cats seek their water in completely different locations from where they seek their food and for very good reasons. Food near their water source can contaminate their water, leading to serious consequences. Which may be why many veterinarians say that having your cats’ water near their food puts them off drinking and cats must drink adequately to remain healthy. We can’t overstate the extent to which cats remain very much creatures of the wild and we need to honor that in them and treat them accordingly. As your cats’ food is nearly always in the kitchen, your water source should be elsewhere and this means your cat fountain is very likely to be somewhere where it becomes part of the décor. Thus the need for a fancy cat fountain. ThirstyCats was created for this very purpose; to provide beautiful, food-safe fountains for cats. 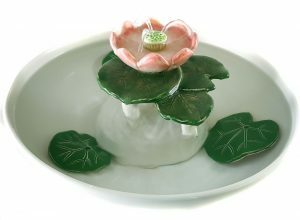 And they are indeed fancy – from the carved and glaze-painted designs on the bubble-up fountains, the leaf and flower and Piazza stream fountains to the gorgeous glaze colors we have developed and continue to develop, there is not a cat fountain on the planet, we and many others feel, that surpasses the beauty of a ThirstyCat fountain. So, if you’re looking for a fancy cat fountain, you’ve come to the right place. And don’t let the price scare you. Our fountains are meant to last a lifetime and over several years, because of our superior filtration system, a ThirstyCat fountain will cost you less than nearly every other brand for which it is necessary to frequently buy new filters. And, they are really easy to clean, as so many customers have stated in their reviews. See our currently available fountains.